Of all the places I visited in Miami, ALL DAY, which opened in the Park West neighbourhood in May 2016, felt most like a British coffee shop, perhaps because, as the name suggests, it serves an all-day breakfast menu (while a staple of American diners, I find it rate in speciality coffee shops). Options include various egg dishes (plus some interesting egg-based sandwiches), along with several non-egg based dishes. ALL DAY also helped itself no end by dispensing with the American curse of counter service, instead bringing your coffee and food to you. Talking of coffee, this is equally impressive, starting with a bespoke, five-group La Marzocco espresso machine, serving a house-blend from Wisconsin’s Ruby Coffee Roasters, which continues a link between Midwest roasters and Miami. Refreshingly, ALL DAY has dispensed with coffee names, instead going for a simple choice of espresso, espresso with milk and espresso with water, while offering a range of sizes. Ruby is also available on filter, either through batch-brew or pour-over via the Kalita Wave, where it is joined by various guest roasters. While I was there, this included local roaster, Per’la Speciality Roasters, and Roseline from the Pacific Northwest, which was supplying the decaf. ALL DAY stands on the east side of North Miami Avenue, equidistance from downtown (south) and the bay (east). Accessible by metro and in the shadow of I395, there really is no excuse for failing to visit. In a parade of shops/cafés/bars, there’s plenty of outdoor seating, with round two- and three-person tables sheltering under the projecting upper floor of the building. Three line the front wall, while with several more are on the opposite side of the pavement by the road. ALL DAY occupies what feels like two units, with glass double doors in the middle of the right-hand unit, flanked by large windows. The second unit, to the left, has a long, narrow, waist-height bar outside, windows above, the central pair of which act as a takeout counter, so to-go customers can order without coming in. The split’s reflected inside, with the seating in the right-hand unit, the counter in the left-hand one. An upholstered bench-seat runs the full length of the right-hand wall, lined with small, round tables, with small wings front and back. Meanwhile, a selection of round two-person tables occupy the middle of the floor between counter and padded bench. Finally, to your left, is the counter, a rectangular affair occupying the whole left-hand side. There are stairs in the back left-hand corner, but sadly upstairs is not open to the public. The long side (the counter’s front) runs along the front of ALL DAY, where you’ll find the takeout window. The short side, where you order, faces the seating and is remarkably broad and uncluttered. 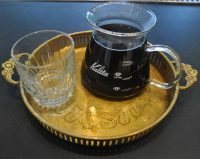 The tablet, which acts as a till, stands in the centre, a tall glass cake stand on the far left and a small pour-over area on the right, with its EK-43 and Uber-boiler. A pillar delineates the end of the counter, with retail bags of coffee on shelves facing the seating. The bespoke five-group La Marzocco espresso machine with Strada-like group heads, complete with paddles, and an EK-30 grinder, occupy a stand-alone island inside the counter. Perhaps best of all, the back of the counter doubles as a four-person bar with really comfortable (fixed) stools. The espresso machine faces front, so there’s a great view of its business end, so you can watch the baristas making espresso to your heart’s content. I visited twice, the first time in the evening, when, sadly, the Eggs Florentine was off the menu, so instead I had the baked double yoke, two eggs baked with leeks and spinach, served in a cast-iron skillet with sourdough toast on the side. As tasty as it sounded, it was extremely filling. I paired this with a 5oz with milk, made using the house espresso-blend from Ruby Coffee Roasters. This was very smooth, the coffee and milk in perfect harmony. I returned the following morning for breakfast, ordering the Eggs Florentine which I was denied the evening before. This was excellent, with nicely-poached eggs, good multi-grain toast and lots of rich, hollandaise sauce. Definitely worth getting up for! For my morning coffee, I looked to pour-over, with a choice of pair of Ethiopians and a Guatemalan. One of the Ethiopians was from local roaster, Per’la. Normally I’d jump at the chance to try a local roaster, but I’d previously had Per’la’s coffee at another (not-to-be-named) coffee shop and came away unimpressed. However, after chatting with the barista, who assured me that it was a light roast, I put my faith in ALL DAY and was rewarded with a lovely, full-bodied, fruity coffee, served in carafe with a glass on the side that was equally worth getting up for! December 2018: ALL DAY was a runner-up for the 2018 Best Breakfast Award. This entry was posted in Breakfast, Cafes, Cake, Coffee Terraces, Evening Opening, Laptop Friendly, Lunch, Miami, Retailers and tagged include, Perla, Ruby, USA2018-01 by Brian Williams. Bookmark the permalink.